Students at the International School of Beijing (ISB) had great fun in welcoming the upcoming Beijing Olympics through an International Olympic Day at their school in Shunyi District on Friday. "We celebrate International Day every year, presenting cultures of different nationalities. As the Olympic Games will be held in Beijing next year, we are celebrating this year's International Day to get the students excited about the Olympics," said Tom Hawkins, the head of the school. It was a massive presentation with nearly every member of the school participating. 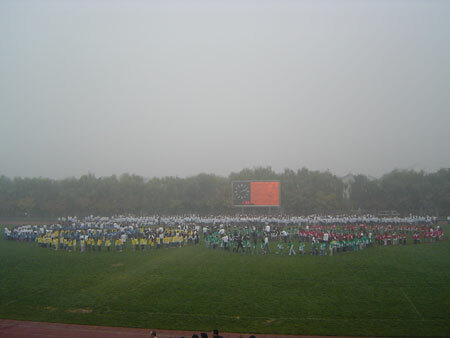 The students and teachers wore T-shirts in the colors of the Olympic Rings and stood in the middle of the field to form the Olympic flag as parents cheered for their children in the grandstand. "We have all the 1,850 students and 200 teachers at the ceremony," said Hawkins before the presentation started. "It’s a pity we don’t have a helicopter to shoot an aerial view of everyone," he joked. There was also a strong Chinese element to the festivities. 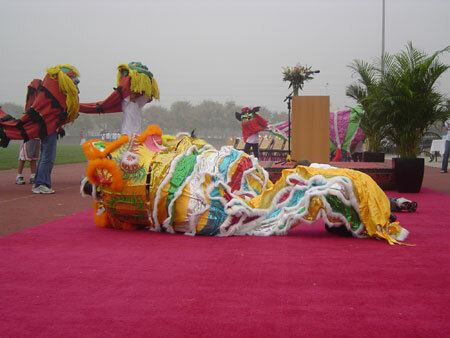 A dragon and lion dance was about to start when some of the students in the field ran out of the crowd to pick up their dragon and lion costumes. But the dance was put off for a few minutes because one of the students holding the lion's head was not there. Everyone was surprised and looked around when a boy rushed out from the crowd after the host called the boy's name on the microphone. People laughed and then clapped when the boy finally emerged. The four dragons and six lions staged a jubilant performance. The lions stuck out their legs, rolled on the ground and jumped over one another. The two pairs of dragons weaved through each other and circled each other before parting. At the end of the performance, the lions went through the audiences to greet them, which generated screams and cheers. "We practiced the performance for just two weeks, and it was easy," said 12-year-old Valtter Lethonen, who held up the dragon head. "The head is a little bit heavy but it is easy for me because I am strong," said the boy from Brazil and Finland. Helena Soares, who was next to Lethonen was excited about the Olympics. She said she already has tickets for table tennis and gymnastics next year. "My family will go to watch together,”"said the 13-year-old Brazilian girl. 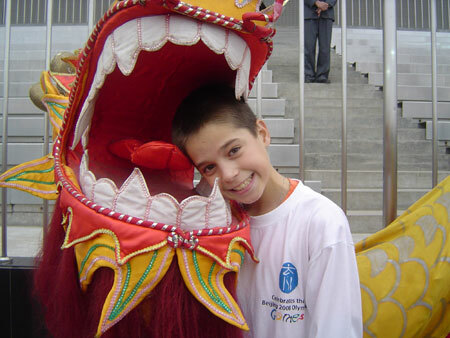 Benedick Chang, 12, from France even knew some of the Chinese athletes. "Yes, I also know the Chinese table tennis players Wang Hao and Ma Lin. And Wang is the world No.1", Chang said, who held the ball on the stick for the dragon to chase. The event included three students reading out the Olympic oath in English, French and Chinese. And following the Summer Olympic Games tradition, over 50 pigeons were released into the sky as symbols of peace and goodwill. Also participating in the ceremonies was 1988 and 1992 Olympic diving champion Gao Min. "I am attending charity and Olympic promoting activities these days and I hope more people will be engaged in the Olympics,”"she told Chinadaily.com.cn. "This year we are giving the students an Olympic education in the school," explained Hawkins. "In visual arts classes we talk about the design of the torch, and students can try out some of the actual events in physical education classes. Next year our school will host the US volleyball team and some of our students will be translators," he added.